Beginning in 1999, the Arkansas Archeological Survey’s program of geophysical remote sensing began revolutionizing archeology in Arkansas. Technologies including ground penetrating radar, magnetometry, electrical resistivity, electromagnetic conductivity, and magnetic susceptibility are now routinely used by the Survey to pinpoint the location of thousands of archeological features ranging in scale from entire prehistoric towns to hundreds of buried prehistoric houses. Using an interdisciplinary approach and cutting edge technologies to inform archeological research has enabled examinations of past settlement patterns and lifeways — both prehistoric and historic — with a precision that was previously unimaginable. Remote sensing is being used to guide excavations, to help develop preservation strategies, and to learn about communities and cultures without extensive excavation, thus improving the Survey’s mission in a time of tight financial circumstances. 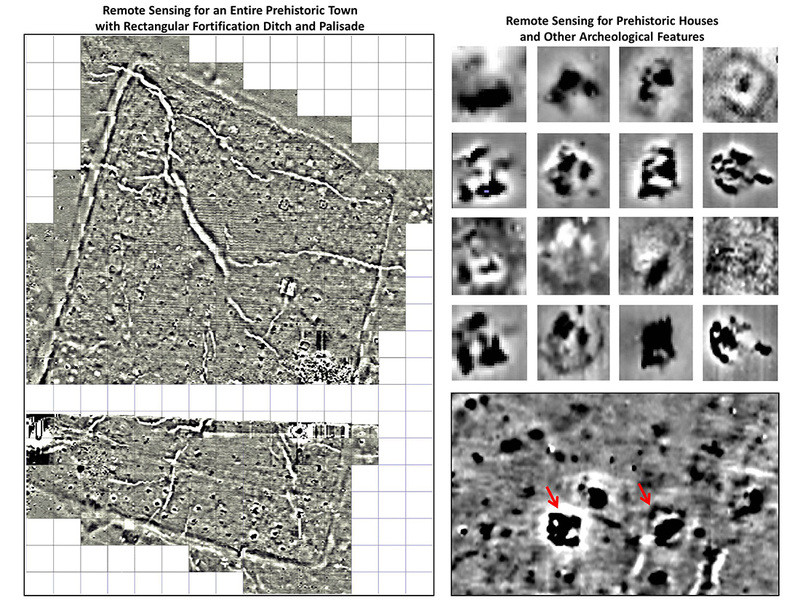 Examples of data collected via remote sensing.